Unlock the secrets to roots style vocal harmonies. 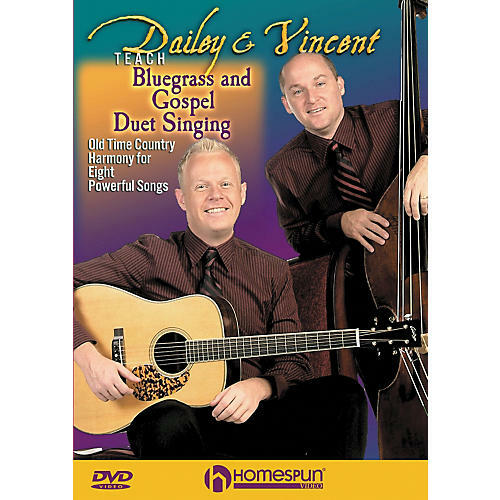 Dailey & Vincent are one of the hottest bands in bluegrass gospel music today. During Jamie Dailey's tenure playing with Darrin Vincent, the band won 13 IBMA Awards-including Vocal Group of the Year from 2001-2007, and the band has barnstormed the country with their exquisite vocal harmonies and amazing instrumental prowess. This unique DVD captures their ideas on singing duets in fun vocal lessons that take apart eight show-stopping songs, including "By the Mark," "Music of the Mountains," and "More Than a Name on the Wall." For all levels. 75 min.